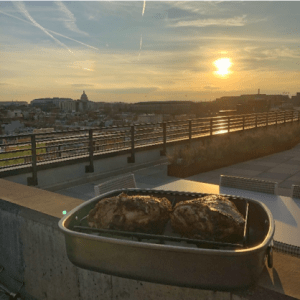 Grilling goat legs in the shadow of the US Capitol building. In February 2019, two important events for Winrock converged in Washington, DC. Winrock’s international agriculture programs held a strategic planning retreat, bringing together colleagues from Little Rock and across the country. Concurrently, Farmer-to-Farmer meetings provided an occasion for representatives from Winrock’s five country programs to travel from Ghana, Guinea, Mali, Nigeria, and Senegal. The rarity of having colleagues, friends, and family from across the world gathered at one time required a proper feast. Enter the goat, provided by our friends at Browse and Grass Growers Cooperative. Cooking to such divergent tastes requires some creativity. For the West African guests, the goat leg was rubbed with Tavia spice rub, braised, and served with rice. For guests from the southern United States, the goat grilled and roasted and served with cheese grits. The combinations were enjoyed by all. 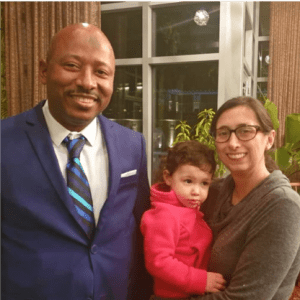 Farmer-to-Farmer Country Director Ibrahima Diallo, Program Manager Gelsey Bennett and daughter Sadie. High quality, sustainably sourced food is not only essential for feeding future generations and protecting the environment, it’s an occasion to gather and strengthen bonds between cultures. “I appreciated the goat you prepare for us, it’s a special meal for important guests in West Africa,” said Papa Diagne, Program Officer for Winrock’s Farmer-to-Farmer program in Senegal. The meal, and especially the goat, provided the perfect centerpiece around which to honor guests and create stronger ties. Winrock International and the Browse and Grass Growers Cooperative partner to implement the USAID Farmer-to-Farmer West Africa program in Mali, assisting local organizations to integrate climate smart practices and develop income generating opportunities to support rural livelihoods. Farmer-to-Farmer fosters information and cultural exchange by fielding American volunteers to share expertise. Winrock and Browse and Grass Growers are working together to increase economic opportunity in Mali.